Infectious illness and litiasis of urinary tract. Antioxidant, Diuretic. Hepato-protector. Gastrointestinal diseases, anti-inflammatory ones, urinary retention, dropsy, prostate discomfort, diabetes, reduces blood sugar, syphilis, blood purifier, gallstones and hepatic disorders - Jaundice. 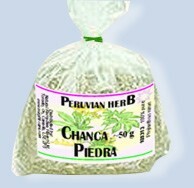 Chanca Piedra grown in the rainforest, has been used by Peruvian herbalist as a treatment for gallstones and kidney stones, urinary infections, hepatitis B, A, C, and antiviral applications for generations. CHANCA PIEDRA has a great number of organic acids that after its ingestion pass through the kidney and are rapidly filtered by the glomerule, avoiding its re-absorption. CHANCA PIEDRA increases the solubility of alkaline salts and help to maintain normal bacterial levels in the uro-genital tract. The phenolic component that it has, have been identified as a strong antioxidant.It is also known its hepato-protector effect on the Hepatitis type B, C, A, herpes, and HIV. This definitive book represents the life's work of the late Richard Evans Schultes, one of the fathers of modern ethnobotany and the greatest plant explorer of our age, including nearly 50 years of field research in the Northwest Amazon. Phyllantus Niruri is a member of the Euphorbiacae’s family including the Iterea gender. The pharmacological properties of this plant depend on its leaves and flowers. Among the phytochemical products are 3, 5, 7 trihydroxiflava-noids, astralgine, brevifoline, carboxilic acid, limonine, lupeol, metilsalicilato, nirantine, nirtraline, nirurine, quercetol, rutina, spoininas, etc. 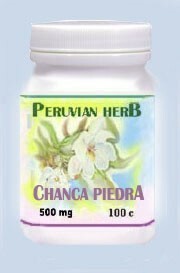 Clinical trials have shown that the CHANCA PIEDRA in-fusion has effective antispasmodic activity.